Preventive equine nutrition naturally is the best way to promote optimum health and vitality for your horses or ponies. 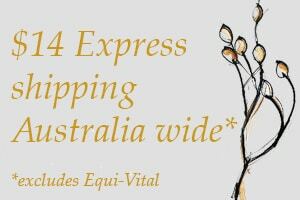 Over the past 20 years the VF Natural Diet has been embraced by thousands of horse owners across Australia – encompassing every breed and sport. Just one of these is La Comtesse de Gruchy from northern NSW. 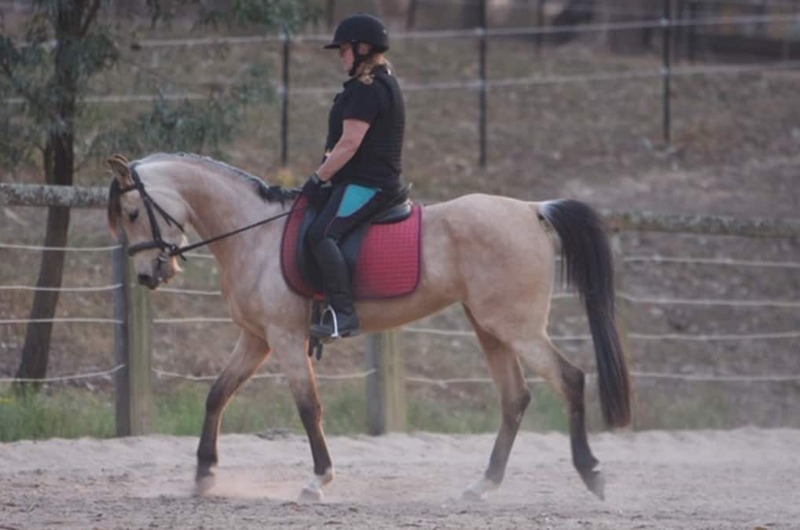 Making a return to dressage riding after a long break, Lynda sought my help to get her buckskin mare Kirrah into good condition, with balanced energy and good muscle tone, so she could easily progress in her training. Kirrah, an Arabian/Riding Pony cross was purchased a year ago as a somewhat underdeveloped newly broken 4 year old. Lynda started her on a diet high in hay and chaff with some pellets and a probiotic/mycotoxin binder. She liked the idea of preventive nutrition providing essential nutrients in a natural form while at the same time preventing illness and disease and protecting the immune system to prevent and lessen the effects of viral and bacterial attacks, amongst a host of other real benefits. Kirrah was transitioned to her new VF Natural Diet diet over two weeks. Kirrah’s Natural Diet Essentials added to her hay and chaff rations were a package of raw feeds and herbs chose for their synergy in providing a complete package of minerals, vitamins, essential fatty acids, anti-oxidants and phyto-nutrients. Black sunflower seeds for their protein and Omega 6 essential fatty acid content, which amongst a range of benefits activates immune cells, inhibits inflammation and improves condition of skin, hair and hooves. French white millet & linseed porridge to provide Silica, working with Calcium and Magnesium to promote healthy bone growth, and further protein through the Omega 3 essential fatty acid content, which is vital for growth, strength, behavioural balance as well as assisting most of the functions of the omega 6 EFA in the sunflower seeds. Rosehips to protect the health of the immune system and capillary circulation, very dense in the lungs and hooves, so an area of stress in any performance horses. A powerhouse of anti-oxidants, Vitamin C, copper and cobalt plus 20 other minerals and vitamins. Brewer’s Yeast and Raw Wheat Germ between them provide a massive number of minerals headed by magnesium and vitamins headed by the B group. Raw Garlic providing sulphur and selenium, and a natural antibiotic only destroying pathogenic bacteria while allowing friendly gut flora to be retained. Seaweed Meal the best all round mineral source with natural iodine which is deficient in most Australian soils. Natural electrolytes provided by organic Apple Cider Vinegar and Himalayan Rock salt. Kirrah’s muscle tone and body condition is reaching optimum levels and she is certainly showing a lovely length of stride and a great desire to move forward in the photo above, taken in January. 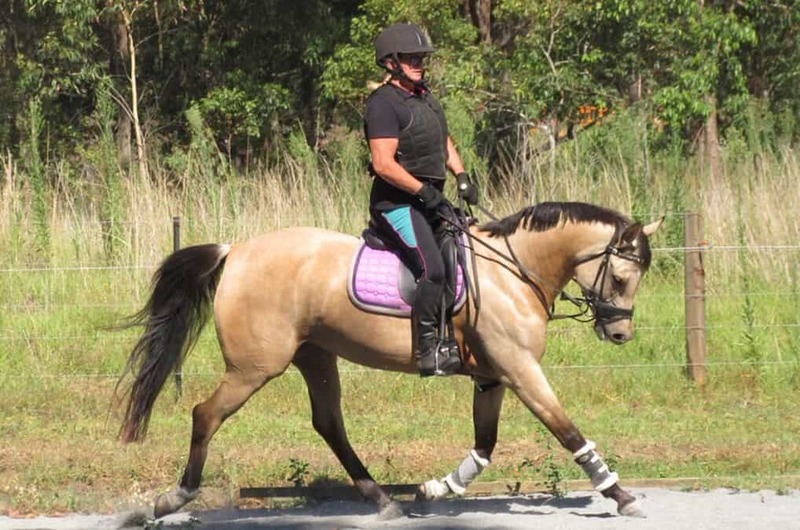 Best of luck on your return to the dressage arena Lynda.